Distinguishable from The Viper Frost range by its laminated silver barrel The Viper Satin Ball Pen is perfect for those occasions where you require a subtle blend of traditional colour with contemporary style. It’s soft rubber grip makes for a comfortable writing experience and it’s low price point makes it suitable for volume promotions. Our unique construction means it is fully compliant with current safety regulations; comes with a high-quality black refill containing documental-quality ink and is available on an optional express service for those last-minute orders. 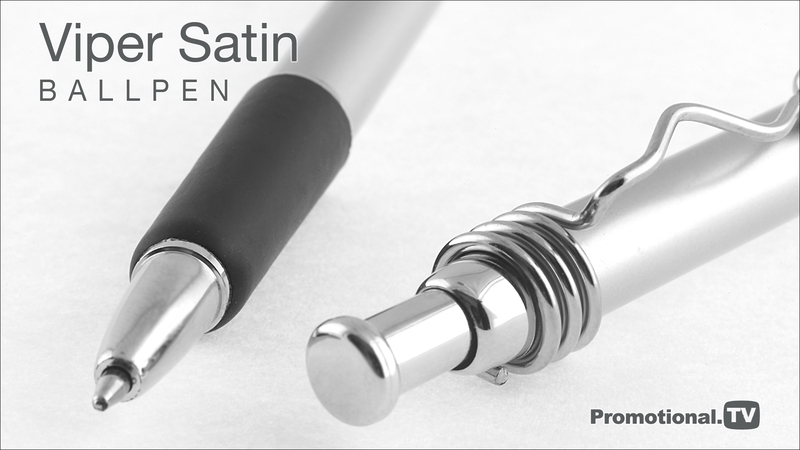 The Viper Satin Ball Pen, as with The Viper Frost operates on a push-button mechanism and your advertising message or logo can be printed on the seamless barrel in up to 4 spot colours, matched to your requirements. It comes with a range of optional presentation packaging, including high-visibility pen pots to display at your next corporate event.